The Panorama Route is one of many scenic drives in South Africa. With amazing views over the Blyde River Canyon, this drive is definitely worth dedicating a day to. Keep reading for more information on where to stay, where to eat, and what to see on the Panorama Route in South Africa. Note that the car park fees mentioned below are the ones we paid in March 2018. It’s probable these are slightly raised by now. Let us know in the comments if you had to pay more! Where is the Panorama Route? The Panorama Route is a scenic drive along the Blyde River Canyon Nature Reserve in the Mpumalanga Province in South Africa. Most people driving from Johannesburg to Kruger National Park take a day or 2 to self-drive the Panorama Route, as it’s on the way. The Three Rondavels were our favorite stop on the route! 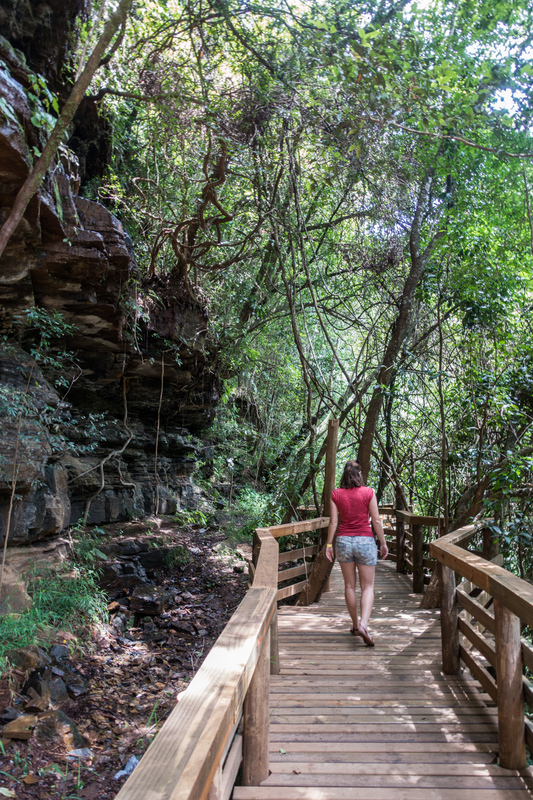 Did you know the Blyde River Canyon is one of the largest canyons in the world? Below we summed up the best stops on the Panorama Route, in order of which we visited them on our 1 day road trip from Hazyview. For each stop you can find the entrance fee, how much time we spent there, and a couple of photos. Note that most of these attractions on the Panorama Route (or their car parks) close at 17:00. Be careful, as there are hardly any railings anywhere. This is a good thing too: no railings on your photos either! TIP: The locations in this article are clickable and will take you to the corresponding marker on the map of the Panorama Route. You can find the map on the right of your screen, or by clicking the map icon on the bottom if you’re on mobile. You can access this viewpoint for free! The Graskop Gorge Lift is an elevator taking your down 51 meter (167 feet) into the Graskop Gorge. The view over the gorge from the top and while riding the elevator is stunning, and there’s a pretty impressive waterfall as well. Looking for an adrenaline rush? There is also a huge swing nearby! Click here for a full review on our experience taking the Graskop Gorge Lift and if it’s worth your money. The Pinnacle Rock is a tall lone rock sprouting from a gorge along the Panorama Route. Entrance to the nearby car park is R15 (~ $1 ~ €0.90) per person. From the car park, follow the paved path to a viewpoint with fencing. Before you reach this viewpoint there’s a dirt path to your left and a paved path to your right. For the best view, take the paved path, continue past the toilet building and make a large U-turn towards the fence. From there you have an awesome view of the pinnacle, the gorge and beyond. Too bad we forgot the battery of our drone at our accommodation, because The Pinnacle Rock would have definitely made for some impressive footage. One of the most popular stops on the Panorama Route is God's Window. The view over Lowveld, the bottom of Blyde River Canyon, is jaw-dropping. There are different viewpoints at different heights, all providing a slightly different perspective over Lowveld. The highest one being the most impressive. If you’re short on time or don’t feel like climbing, you can skip God’s Window and pull over at Wonder View instead. The view over Lowveld is pretty similar, without the climbing and the crowds. Bourke's Luck Potholes was the busiest stop on the Panorama Route. It has the largest car park and a museum, so it’s probably fair to call this the most touristy stop on the Panorama Route. Okay, after Harrie’s Pancakes probably, but more on that when we discuss lunch. Bourke’s Luck Potholes are what they call the big “bowls” that were eroded by the water from the Blyde and Treur River that come together there. You have the best view from the bridges, the farthest being the best. Although the potholes are the main attraction of this stop, everyone seemed to be more interested in the small waterfalls you see on the far right when walking towards Bourke’s Luck Potholes. If there’s one place you should stop on the Panorama Route it’s the Three Rondavels viewpoint. Definitely the coolest view on our Panorama Route road trip! Did you know a rondavel is an African-style hut? That’s where this landmark got its name! When driving towards the Three Rondavels viewpoint, you’ll pass a pay point asking for a R25 (~ $1.70 ~ €1.50) entrance fee per person. From there’s it’s another 2 km to the car park. There are 2 different paths leading to 2 different viewpoints. They’re fairly close to each other, while still providing a different view. Worth checking out both, although the left one is slightly better. You’re closer to the Three Rondavels there, and you’ll also see the blue water of the Blydepoort Dam. It wasn’t busy at all when we visited around 15:00 in the afternoon, so we could search for the geocache that’s hidden there without worrying about being discreet. Lowveld View is pretty amazing! The Lowveld View provides another look over the Three Rondavels, but from a different angle. From the car park, follow the paved path to the edge of the cliff. Be careful, because there are hardly any railings here. Even though it’s similar to the Three Rondavels viewpoint, we still consider the Lowveld View a must-stop on the Panorama Route. Note that the car park closes at 17:00. If you’re driving the Panorama Route, you should make a short stop at the Lisbon Falls as well, a lovely waterfall, plunging down 92 meters (~ 302 ft). The Berlin Falls are very nice too. The water is “only” plunging down 80 meters (~ 262 ft) and you’re a bit further away, so it might not feel as impressive though. There aren’t too many lunch options along the Panorama Route, but the most popular one is without a doubt Graskop, a town at one end of this scenic drive. Although Graskop is a small town, there are quite a few restaurants to choose from. We opted for the tourist favourite: Harrie's Pancakes. Harrie’s Pancakes has locations in 4 different towns in South Africa, all between Pretoria and Graskop. Their signature dish is obviously pancakes, with a bunch of savoury and sweet fillings. They serve soup, salads and a bunch of breakfast options as well though. We parked across the street from Harrie’s and had to dodge some hawkers before securing a spot on the lovely wooden porch (no hawkers allowed). It got busy quickly, so best arrive before 12:00 to be safe. Prices for Harrie’s famous pancakes range between R20 (~ $1.40 ~ €1.20) and R116 (~ $8 ~ €7), for fillings from cinnamon and sugar to smoked trout fillet. Brecht ordered a pancake with Chili Con Carne (R86 ~ $5.90 ~ €5.20), me one with seasonal fruit, ice cream and chocolate sauce (R91 ~ $6.20 ~ €5.50). If you want some snacks for the road as well, check out the Chocolate Shop and the Biltong Shop that border Harrie’s porch. Graskop is usually recommended as the best place to stay near the Panorama Route, as it’s close to all major attractions. It’s a bit touristy, but this also means there are plenty of accommodation options to choose from, in different price categories. Click here for a list of all accommodation options in Graskop according to HotelsCombined and book at the best price. We, however, stayed at Dreamfields Guesthouse in Hazyview, which is on the way from Johannesburg to Kruger National Park. From Hazyview it’s about a 40 min drive to Graskop, the start of the Panorama Route, which makes this scenic drive perfect for a day trip. Prefer a guided Panorama Route day tour? With spectacular views and thundering waterfalls, the Panorama Route is definitely worth the detour on your way from Johannesburg to Kruger National Park.